In June 1948 the Empire Windrush docked at Tilbury, bringing just under five hundred immigrants to the UK - mainly from the West Indies. This event symbolised the begining of large scale immigration to the UK from Commonwealth countries. 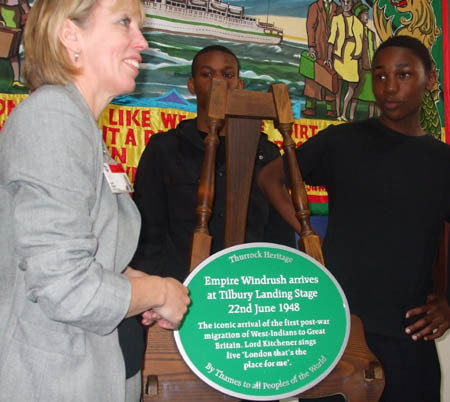 Sixty years later, the event was celebrated by a Thurrock Heritage plaque at the London Cruise Terminal. The plaque was unveiled by Lynda Viccars, Cruise and Marine Co-ordinator at the Port of Tilbury. It includes the words of the calypso musician, Lord Kitchener, who was one of the passengers. The Windrush Ferry brought a party of Windrush survivors and descendents of the Windrush generation to Thurrock from Tower Hill. Visitors were given a tour of the terminal by Heritage Officer, Jonathan Catton. The event was hosted by the Port of Tilbury and the Thurrock Festival Group and was supported by the heritage lottery fund.